Designs by Lisa Somerville: PDCC#52 Happy Anniversary! 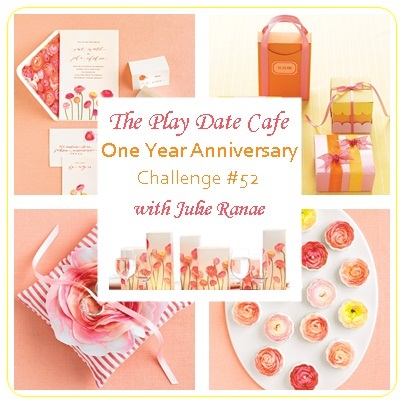 Thanks so much for stopping by for this weeks Play Date Cafe Color Challenge! You're in for a special treat this week, as the PDCC celebrates it's One Year Anniversary! This week we have Unity Stamps Sponsoring us with a set of 15 Itty Bitty Stamp sets going to this weeks winner. There will also be a giveaway from Cosmo Cricket. We are thrilled to welcome back some PDCC Alumni Designers playing along with us, there will also be daily posts on the PDCC Blog, as the Unity Design Team will also be joining in on the celebration! The PDCC Designers were all given stamps by Unity this week for our postings, the image I received is Hello My Friend. I found some fab papers from Prima that had the orange/pink/green and yellow color from this weeks color story and used that as my background. I did sponge on some Distress Ink in Dried Marigold to the edges. The heart is stamped on Watercolor paper, I sponged on Distress Ink in Victorian Velvet and Sponge Sugar to add color. Then Spritzed a Prima Flower with Perfect Pearls Mist in Sunflower and adhered to the heart. Some Zva Flourish Pearls are added for interest behind the image. Here's this weeks Color Story Photo. We'd love for you to play along with us at the Cafe, you can find all the details here on how to enter. If you upload to any online gallery please use keyword PDCC#52 so we can find your creations! such a fun and cheerful card, can't wait to play with the new colors! Lisa...it's been such a great experience for our entire team to have you be with us for nearly 9 months of the year! Your creativity has been such an inspiration to our team and to our players...you worked your magic with this week's stamps and colors, too! WOW, awesome card Lisa, I absolutely love all the techniques and the colors are so beautiful. Excellent work. Love the flourish! Great highlight for the heart! Beautiful clean design. Lovely colors on your background. Pretty card Lisa! 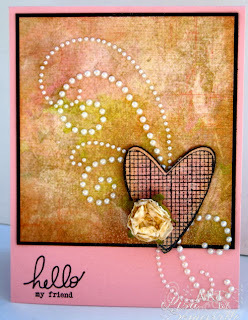 Love the pearl flourish & fun background! Beautiful card! Love the way you used the colors on the background!! The flourish and flower is a lovely touch! Have a wonderful day! Love the flourish pearls on this card, gorgeous! Such a simple, but classy and elegant card. I LOVE it! Your flourishes work beautifully with it. Ooooooo quite lovely! The Zva pearls are the perfect touch to this beauty! This is just lovely, Lisa! The pearl flourish adds a beautiful touch! So pretty!! I love the pearl swirls and the heart and well, all of it! So pretty! ps...I forgot to say....HAPPY ANNIVERSARY:) LOL! This card is really wonderful! Beautiful design, Lisa! Love that adorable heart and the flourishing pearl bling that adorns it! Wonderfully cheery and pleasant! Such a beautiful card! Love the heart surrounded with gorgeous bling!! !